In early 1924 the club received a letter from the Town Clerk stating that Brighton Corporation would like to stage an Open Golf Week, and would the Club be prepared to organise an Amateur Tournament on their behalf. Not only did they accept, but the stalwart Saunders Brothers (AE & BJ) offered to guarantee the necessary funds. A sub-committee was formed, and not wishing to be outdone, they decided it should be run on similar lines to the Bournemouth Tournament. The week of golf events opening with ‘Ladies Day’ proved a great success – in some years attracting up to 400 entries for the seven competitions from golf clubs from far and away ending with a prize-giving ceremony hosted by the Mayor. 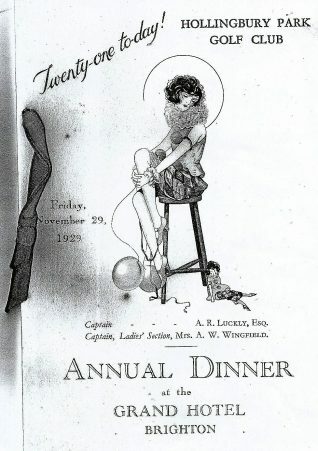 Some of the competitions were so popular that early entry was required to guarantee participation. 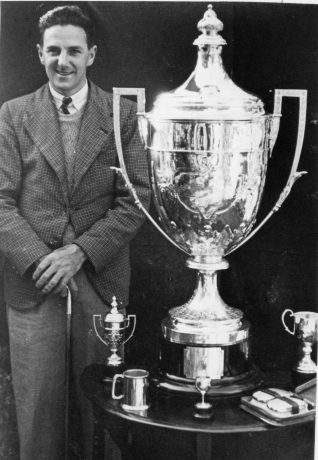 The picture shows A E (Chummie) Hewett pictured in July 1937 with the magnificent Victor Ludorum Cup awarded for best aggregate points in the seven competitions. Chummie was a club member for 72 years. 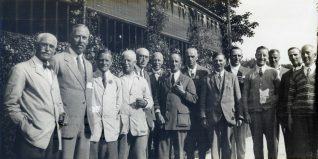 The cup was sold in 1946 and the £50 proceeds were used to purchase two cups (a Ladies and a Gentlemen’s) to perpetuate the memory of the Saunders brothers who had been so influential in the development of the course and supporting the club to grow and prosper. Arthur Saunders put an enormous amount of work into organising the event; though he always wished it to be ‘behind the scenes’. He became Captain in 1924 known to members affectionately as ‘Uncle Arthur’. Benjamin Saunders became affectionately known as the ‘Father of the Course’.